Cyclocross is very demanding of your legs and upper body, and you can easily lose position by not having a strong core. Your core is the weak link connecting your legs and upper body, so core strength becomes crucial for fast run-ups and getting over barriers quickly. Assuming you’re running a couple days a week (transitioning down to one day a week during race season), start with 5 minutes of core workouts at the end of each run session, and gradually build that to about 25 minutes. Do core workouts with good form. Here are five core exercises that will help you perform at your best for the cyclocross season. Lie on your back with your hands behind your head and both knees raised up so they are above your hips. Lift your shoulders off the ground then rotate your upper body at the same time as raising one of your knees. (You will be attempting to have one elbow and the opposite knee touch or get closer). Repeat motion with the opposite side. The whole time your shoulders are off the ground and you are rotating your torso and moving your knees much like you would when cycling. This is a fast tempo core exercise. Lie face down with arms next to your hips. Lift your head, arms and legs off the ground. Rotate your arms all the way until they touch in front of your head and all the way back next to your hip (starting point). Make sure to keep your legs and chest off the ground. Be sure to tighten your abs as you lift your body up. Try and do at least 10 before you go the next exercise. This is great for all posterior muscles. Lie on your back with legs straight up towards the ceiling (you can have a slight bend in your knees if your hamstrings are tight). Try and reach your toes, do not let your shoulders come all the way down before going back up. This is fast tempo exercise. Lie down on your back with your arms at 90 degrees to your torso. Lift both legs up until they are above your hips. Slowly lower them within 6 inches of the ground before you lift them back up again. Try and not let your head, or shoulders come off the ground as you lower your legs. Swing your legs side-to-side like a metronome. Take them to about 45 degrees on each side before changing directions. The faster you do this the harder it is. Don’t let your shoulders or head come up as you do this. 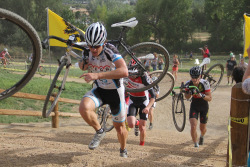 Read Transition to Cyclocross, Part 1 for more tips on how to get ready for cyclocross season.